I first heard of Valiant back in February when Cuddlebuggery hosted a blog hop to celebrate (and mourn) Egmont Publishing’s last list. Although I was ultimately assigned to review Anne Bustard’s Anything but Paradise as part of that blog hop, I was so intrigued by Valiant’s premise that I requested an advance copy of it from NetGalley anyway. 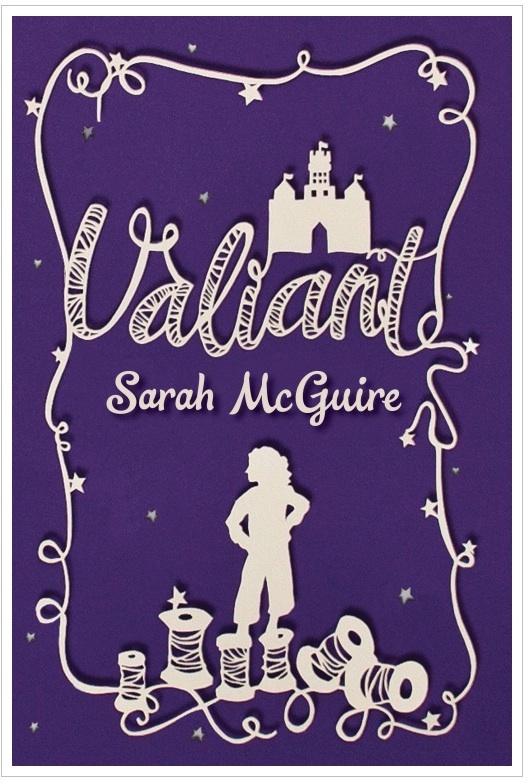 Aimed at Middle Grade readers, Valiant reworks the story of the Brave Little Tailor from the perspective of a teenage daughter who despises sewing, but is forced to take over her father’s business to keep from starving after her father suffers a debilitating stroke. Women are not allowed to act as tailors, so Saville cuts her hair, and becomes Avi, Tailor to the King. A few weeks later, Saville befriends Will, a boy even younger and hungrier than herself, whose parents were lost when his village was attacked. She takes him in under the guise of needing someone to look after her father while she tends to the family business. She does need the help, but she needs the companionship Will offers more. When Will is attacked by giants, Saville is the only one in the king’s city of Reggen who is brave enough to save him. She does so using the tricks I remembered well from the original fairy tale — squeezing the water from a cheese that she claims was a stone, tossing a bird in the air and claiming to have thrown a stone so high it forgot to fall, and best of all, telling the giants that they have been beaten in these marvelous feats of strength by a mere tailor. Although my memory of the fairy tale ends there, McGuire’s novel is just getting started. Saville’s actions draw the attention of the king, and she becomes a pawn in a political game for which she has little patience or understanding. And all the while, the threat of the giant army is looming. The emotional resonance of the world McGuire spins out from the story of the Brave Little Tailor reminds me of Robin McKinley at her best. The emotional distance between Saville and her father is difficult to endure, but no less true. That relationship drives the friendship between Saville and Will, making us understand intuitively why this girl would face giants not once, but twice, to protect this young boy whom she has taken in out of defiance of her father. And then, of course, there’s Lord Verras. Enjoyable though the interactions between Saville and Lord Verras are, this is no simple-minded love story. McGuire throws up plenty of roadblocks between Saville and Verras. Social status, personality conflicts, political intrigues, an army of invading giants, a weak-willed, temperamental, and cowardly king all complicate this particular relationship. In the end, though, it all works out, and in the sort of deeply satisfying manner that you only find in the best fairy tales. “Reggen still sings the songs about the champion, the brave tailor — though I can’t help laughing to hear such words describe me. I was not so brave, and there were other champions that summer morning. Perhaps, time will wear away our names until we are as blurry as the Guardians and no one can remember where we came from. But for those who wish to know, this is everything that happened. If you enjoy novels that weave entire worlds out of the mythical forests of fairy tales, you will love this book. Disclosure: I received a free kindle copy of Valiant via NetGalley in exchange for a fair review. And then I loved it so much, I promptly ordered a second copy off Amazon for my Eight-Year-Old daughter.